Beherit have undergone many sound changes over the years since their formation in 1989. The Finnish group released one of the most revered black metal albums of all time, Drawing Down the Moon, in 1993 and soon after only one original member remained in the band. Nuclear Holocausto Vengeance (NHV) kept the band afloat by turning Beherit into a dark ambient one man show until finally disbanding in 1996. Resurrected in 2007, the band has seen two full-length releases since, Engarm in 2009 and more recently At the Devil's Studio 1990 in 2011, and now an EP. What does Celebrate the Dead have in store for listeners? Beherit have undergone many sound changes over the years since their formation in 1989. 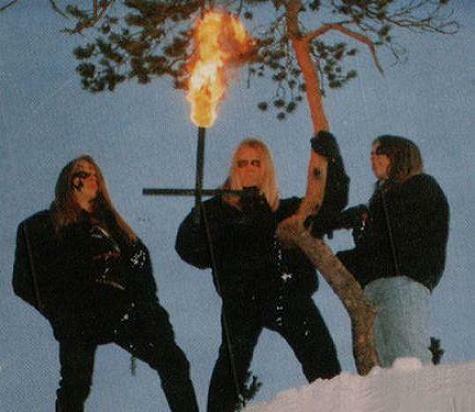 The Finnish group released one of the most revered black metal albums of all time, Drawing Down the Moon, in 1993 and soon after only one original member remained in the band. Nuclear Holocausto Vengeance (NHV) kept the band afloat by turning Beherit into a dark ambient one man show until finally disbanding in 1996. Resurrected in 2007, the group has seen two full-lengths, Engarm in 2009 and more recently At the Devil's Studio 1990 in 2011, and now an EP. What does Celebrate the Dead have in store for listeners? 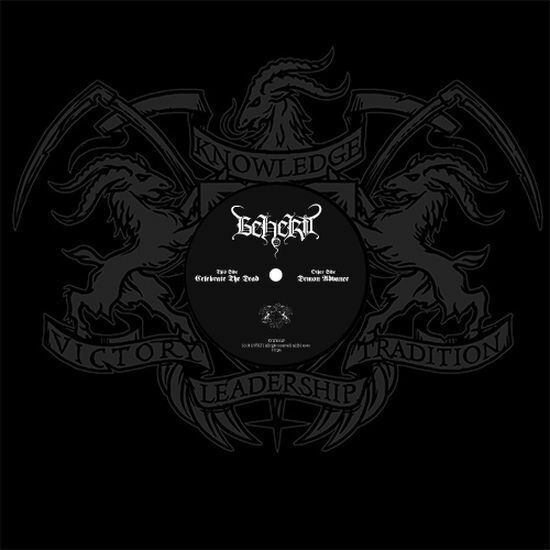 Beherit have always been very obscure, having wanted to be "the most primitive, savage, hell-obsessed black metal imaginable". They've progressed a long way from being primitive by any means, having kept a fondness for synthesizer keyboards since NHV released the two dark ambient albums in the mid 90's. But they have fluctuated back and forth in style, with Engarm having gone back to their greasy black metal roots with a slight audio upgrade. "Demon Advance" comes from the aforementioned album, but it's been rerecorded and for the better. 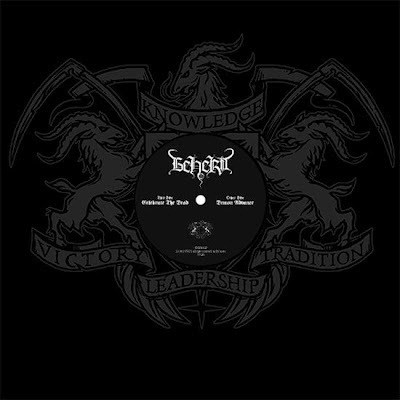 The audio quality has a dirty, classic black metal tone to it and the track has been slow down and stripped of a few layers as to the version found on Engarm. The vocals are also a lot more demonic in tone and have a frightening depth to them, enhanced by occasional reverb effects at certain times. For those unfamiliar with the song itself, the slow guitar riff stays the exact same for the first four and a half minutes, backed by a deep and pounding set of drums that stick to the same slow tempo. A small ensemble of rung out chords follow and the song completely changes from everything that was happening previously around the five and a half minute mark. The new high-treble guitar riff finds itself backed by a more noticeable bass line, and keyboards lightly litter the audio. Overall the song is very well structured and changes things up before the composure gets too tedious and it's full of dark, hooky riffs. The title track, "Celebrate the Dead", takes on a completely different sound and feel. The guitars are so distorted and laden with effects, it's hard to tell if they're synthetic or real and the same can be said for the drums when they finally come into play. From this point on everything the listener will hear is one continuous loop of six seconds of music for the next eight minutes. Every now and then the drums fade in and out at random times, or some effect comes in to distort an instrument to provide variety to this incredibly monotonous pattern. At around the four minute mark, the main guitar and drum riff takes a backseat but can still be heard clearly despite being fuzzed out, and a clean tone keyboard comes in layered over top. A radically different set of vocals are found in this track, and at first they start as barely a whisper. During this part, the vocal track is mixed so low it's impossible to be able to define any real lyrics at all. This tedious nightmare finally ends at around the eight minute mark, and in it's place we are left with a cut and dry set of synthesizer organs that become backed by another irksome drum pattern. The vocals that accompany this new melody will make one wish that the whispering would come back since they are clean sung, sometimes off key and repeat the same verse over, and over, and over, and over again for four horrifying minutes. These vocals are backed by the same, unrelenting beat until the song finally ends. This song sees a total of two major beat changes in sixteen minutes with very little to diversify the antagonizing monotony. So what's the final word on Celebrate the Dead? It's a desperate, tiresome disaster that should be avoided at all costs. Even fans of Beherit's dark ambient work would be well advised to keep a hundred feet away from this toxic bile. "Demon Advance" is the better of the two and has consistent tempo changes with a good range of enjoyable riffs accompanied by some fun and effective drum beats. However, it was also on Engarm and is just a slightly modified version, though the modification works in favor of the song more-so than what is found on its home record. "Celebrate the Dead" is just a tedious waste of time and is only entertaining for the first three or four minutes, and being the longer of the two tracks and the title of the EP itself one would expect more effort to have been put into it. Alas, little to no effort went into Celebrate the Dead and it's a shameful waste of time.